The past, present and future with Warren Patterson. Members of the Olsen family gather around a newly planted Autumn Blaze maple in memory of the late Paul Olsen. (L-R): Jeff, Diane, Linda, Jennifer and Peter Olsen. 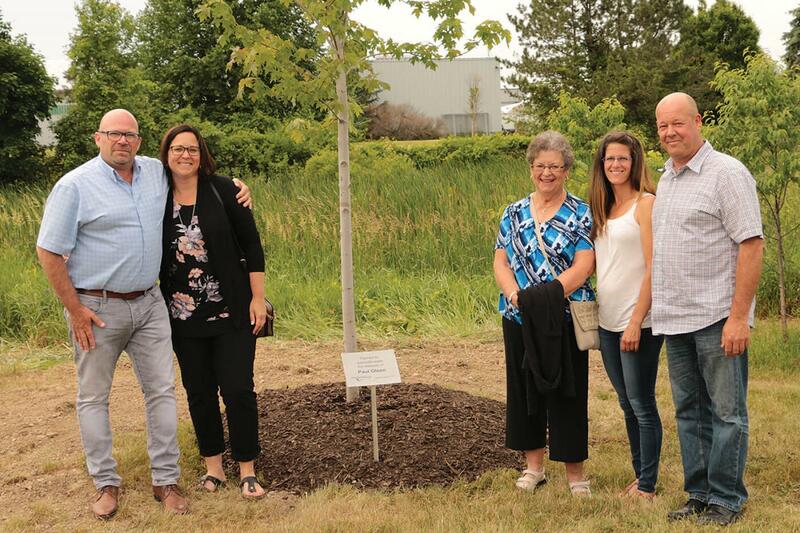 On June 20, Landscape Ontario’s Provincial Board of Directors joined members of the Olsen family for a special memorial tree dedication ceremony for the late Paul Olsen at the LO home office in Milton, Ont. Son Jeff Olsen spoke on behalf of the family about his father’s two main passions: Landscape Ontario and trees. “We grew this Autumn Blaze maple at our farms in Port Hope and I thought it would be very special that we planted a tree that my dad actually saw,” Olsen said. Would you please extend to all the members of LO how much our family appreciates the recognition given to Paul on his service to the industry. He had a keen interest in the financial, as well as educational, aspect of the organization and I am sure he would be all in favour of the future renovations of the facility. The work that you do for the industry is so important and I am pleased to see the young people stepping up to the plate to continue the legacy of the “old timers.” Thank you once again for the lovely lunch and tree dedication ceremony.